In large dutch oven heat olive oil and add in onions. Saute for 5 mintues then add in garlic and tomato paste. Let garlic and tomato paste slighly brown on the bottom, stirring to prevent burning every so often, about 3-5 more minutes. Slowly add in a little broth and scrape the bottom of the pan to get all the little bits up. Stir in well then add in the rest of the broth along with carrots, celery, poblano pepper and the rest of the ingredients and spices except zucchini and beans. Bring to a boil, reduce heat to simmer, cover and simmer for 10 minutes or until carrots and celery are mostly tender. Add in the zucchini and beans and continue to simmer until all the veggies are tender. Taste for salt and add in an extra tablespoon of worchestershire sauce if you want an extra flavor boost. Garnish with a little parsley or chopped green onion and serve with a good slice of a rustic baguette for a nourishing and full meal. 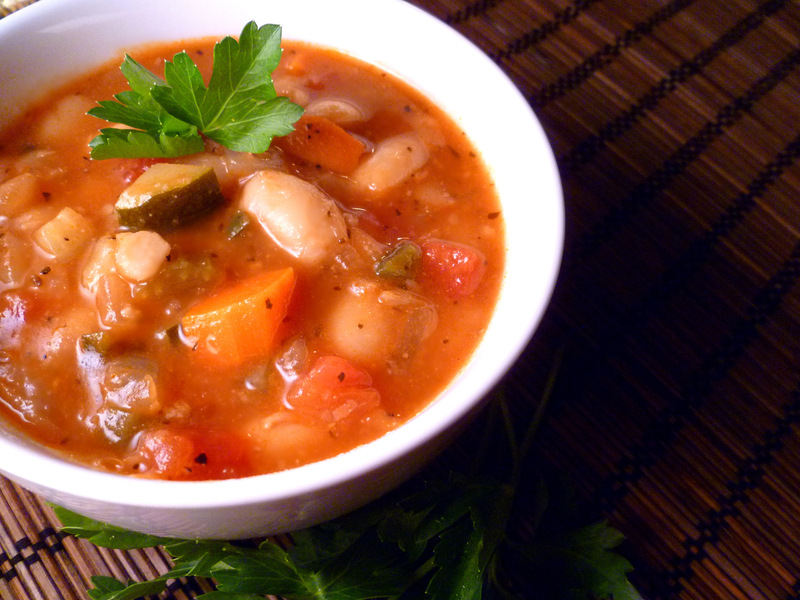 As with most veggies soups, this is very versatile. If you have some extra veggies you like, add them in! I used dried beans so its fairly common for me to have a little extra (or less). You don’t have to be exact on the beans. The cumin and worchestershire sauce work as flavor workhorses in this soup. Add in an extra bit if you like yours very flavorful. I don’t cook, but can congratulate you on your decent photos which make every dish look appetising. I’ll lean on Roz to try a few recipes….